Now that the Tea-Party-enhanced GOP has firm control of the U.S. House of Representatives and overwhelming control of the Texas House, it has a golden—perhaps once in a lifetime opportunity—to significantly change the way things are done in both Washington and Austin. In Texas, it would be a stunning rebuke to the newly emergent Tea Party energized conservative voter to put Representative Straus back in as Speaker. He “cut a deal with the devil” two years ago. After rising to the speakership by being the pick of liberal Democrats and Rinos and running against the Republicans, he ran a terrible session—kowtowing to the de facto Democratic party filibuster of the House. This shut down debates and votes on pending legislation wildly popular with Texans relating to ballot integrity, borders, photo-ID for voting, 2nd Amendment rights and many others. It was an unmitigated disaster and he let it go on and on and on and on and on, running out the clock rather than playing the game when we had the winning team on the field. Would he do the same for say, redistricting this time? It is also reported that Straus has a $700,000 pending Texas Ethics Commission violation. In short, we can and should expect better with a massive majority in the Texas House (99-51 at last check). In the U.S. Congress, things are a bit more complicated, since the GOP only controls the House and not the Senate. This is where the divide and conquer strategy seems worth considering. Simply put, the U.S. House should refuse to enact and pass “omnibus” bills OF ANY SORT. These bills that no one reads amount to legislative bribery, where coalitions are put together to pass things that would never stand on their own merits. Every bill should be short, clearly titled and worded, put on the internet for at least 21 days before debate, and voted up or down on its own merits, not on the merits of some perceived overall package benefit as the Democrats are infamous at doing. 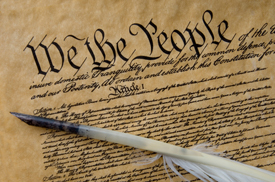 Since true conservatives are united by overarching principles of smaller government, lower taxes, American exceptionalism, Constitutional Republic government, the free enterprise system and solid Biblical principles, and conversely, the Democrats are largely an amalgamation of wildly different special interest groups (big government liberals, Marxist/progressives, secularists, pro-abortionists, anti-war groups, ivory-tower academics, radical environmentalists, unions and special interests that would not survive in the marketplace without government life support), they are far less united on principles than are most Republicans. Will everything get through the Senate or be signed by Obama? No, but that should not stop the House from mounting an all-out offensive. If, for example, the U.S. House abolishes the current monstrosity we call the income tax in favor of a “Fair Tax” or similar, this would resonate with current and future voters. Would the Senate, one-third of which faces re-election soon, refuse to pass it? Senators know We (the People) are watching! If every issue were to be vetted, as former GE Chairman Jack Welch said today, in terms of whether it is good or bad for job creation and were to pass or fail on its own narrow merits, the GOP will have done the right thing for both the issue and the process. Every bill should have an “Economic Impact Statement” and its “Constitutional Authorization” specified. For example higher taxes cost jobs and hence should be rejected. The millstone around the neck of the economy at the moment is Obamacare—it raises medical costs and discourages hiring and should be rejected using all available strategies. Cap and trade would destroy millions of jobs and should be rejected. Deepwater drilling provides both jobs and domestic energy, and should be encouraged. Bureaucratic regulations decrease efficiencies, usurp legislative processes and cost jobs. Agencies such as the FCC, the EPA, and the NLRB should be reined in, one by one. (The NLRB is currently trying to bureaucratically ignore Congress’ rejection of “card check” legislation by re-defining labor union election rules. The EPA is trying to shut down offshore drilling and implement cap and trade in a backdoor fashion. The FCC is trying to implement the fairness doctrine and regulate the internet). If the Senate and/or Obama refuse to do what WE THE PEOPLE clearly and overwhelmingly called for Tuesday, 2012 is right around the political corner.